Objective: The main objective of this study is to define and operationalize the concept of immigrant capital, a key factor that differentiates immigrant from host country entrepreneurs in how they recognize and start new ventures. Research Design & Methods: A detailed analysis of contemporary immigrant entrepreneurship and opportunity recognition literature was carried out. Using grounded theory, we synthesized the outcomes from the analysis of eight Canadian and U.S. case studies of successful immigrant entrepreneurs with the key findings from the literature to define and develop a model of immigrant capital. Findings: Based on our grounded theory development process we show that the concept of immigrant capital as a distillate of human, cultural, economic and social capital that goes beyond expected opportunity recognition (OR) drivers like prior knowledge and prior experience to differentiate and enhance the immigrant entrepreneur's ability to recognize business opportunities compared to host country entrepreneurs. We found immigrant capital to be a consequence of being boundary spanners in host and home country networks. Implications & Recommendations: Understanding a unique resource like immigrant capital, will help immigrant as well as host country entrepreneurs further develop their opportunity recognition ability by bridging gaps and fulfilling the needs for both, immigrant and host country consumers. Contribution & Value Added: The main contribution is the theoretical development, identification and definition of the immigrant capital model and propositions that will articulate the factors that lead to the conceptualization and operationalization of immigrant capital. Furthermore, the immigrant capital model can serve host country entrepreneurs to develop cross-cultural networks and jump-start entrepreneurial activities in their home countries as well as learn how to expand their operations into global markets. Akee, R., Jaeger, D. A., & Tatsiramos, K. (2007). The persistence of self-employment across borders: New evidence on legal immigrants to the United States. Available at SSRN 1136412. Aldrich, H. E. (1990). Using an ecological perspective to study organizational founding rates. Entrepreneurship Theory and Practice, 14(3), 7-24. Aldrich, H. E., & Zimmer, C. (1986). Entrepreneurship through Social Networks, University of Illinois at Urbana-Champaign's Academy for Entrepreneurial Leadership. Anderson, A. R., & Miller, C. J. (2003). Class matters: human and social capital in the entrepreneurial process. Journal of Socio-Economics, 32(1), 17-36. Baron, R. A., & Ensley, M. D. (2006). 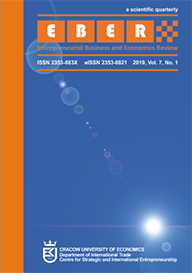 Opportunity recognition as the detection of meaningful patterns: Evidence from comparisons of novice and experienced entrepreneurs. Management science, 52(9), 1331-1344. Barrrett, G.A., Jones, T.P., & McEvoy, D. (2003). United Kingdom: severely constrained entrepreneurialism. In R. Kloosterman & J. Rath (Eds. ), Immigrant entrepreneurs: venturing abroad in the age of globalization. Oxford: Berg. Bash, L., Glick Schiller, N., & Szanton Blanc, C., (1994). Nations Unbound: Transnational Projects: Postcolonial Predicaments and Deterritorialized Nation-States. Amsterdam: Gordon & Breach. Bhagavatula, S., Elfring, T., van Tilburg, A., & van de Bunt, G. G. (2010). How social and human capital influence opportunity recognition and resource mobilization in India's handloom industry. Journal of Business Venturing, 25(3), 245-260. Cardon, M. S., Wincent, J., Singh, J., & Drnovsek, M. (2009). The nature and experience of entrepreneurial passion. Academy of Management Review, 34(3), 511-532. Christenson, P.S., & Peterson, R. (1990) Opportunity Recognition: Mapping the Sources of New Venture Ideas. Paper presented at the 10th annual Babson Entrepreneurship Research Conference, Denmark: Aarhus University Institute of Management. Contreras-Sweet, M. (2015). Immigrant Entrepreneurs Help Fuel Record Growth Streak. Retrieved on May 30, 2015 from https://www.sba.gov/blogs/immigrant-entrepreneurs-help-fuel-record-growth-streak. Dana, L. P. (1996). Self‐employment in the Canadian Sub‐Arctic: An Exploratory Study. Canadian Journal of Administrative Sciences/Revue Canadienne des Sciences de l'Administration, 13(1), 65-77. Douglas, D. (2003). Inductive theory generation: A grounded approach to business inquiry. Electronic Journal of Business Research Methods, 2(1), 47-54. Fairlie, R.W. (2008). Estimating the contribution of immigrant business owners to the U.S. economy. Office of Advocacy Research Summary No. 334. Washington: Small Business Administration. Foo, M. D., Uy, M. A., & Baron, R. A. (2009). How do feelings influence effort? An empirical study of entrepreneurs’ affect and venture effort. Journal of Applied Psychology, 94(4), 1086-1094. Friedman, R. A., & Podolny, J. (1992). Differentiation of boundary spanning roles: Labor negotiations and implications for role conflict. Administrative Science Quarterly, 37, 28-47. Froschanuer, K. (2001). East Asian and European Entrepreneur Immigrants in British Columbia, Canada: post-migration conduct and pre-migration context. Journal of Ethnic and Migration Studies, 27(2), 225-240. Furman, J., & Gray D. (2012). Ten Ways Immigrants Help Build and Strengthen Our Economy, Retrieved on May 30, 2015, from https://www.whitehouse.gov/blog/2012/07/12/ten-ways-immigrants-help-build-and-strengthen-our-economy. Glaser, B., & Strauss, A. (1967). The discovery ofgrounded theory. London: Weidenfeld and Nicholson. Hart, D. M., Acs, Z. J., & Tracy, S. L. (2009). High-Technology Immigrant Entrepreneurship in the U.S. U.S. Small Business Administration, Office of Advocacy, July 1 2009. Hofstede, G., Noorderhaven, N. G., Thurik, A. R., Uhlaner, L. M., Wennekers, A. R. M., & Wildeman, R. E. (2004). Culture. In Brown, T. E. & Ulijn, J. (Eds), Innovation, Entrepreneurship and Culture (pp. 162-203). Cheltenham, UK: Edward Elgar. Hostager, T. J., Neil, T. C., Decker, R. L., & Lorentz, R. D. (1998). Seeing environmental opportunities: effects of intrapreneurial ability, efficacy, motivation and desirability. Journal of Organizational Change Management, 11(1), 11-25. Krueger, N.F. (1993). The impact of prior entrepreneurial exposure on perceptions of new venture feasibility and desirability. Entrepreneurship Theory and Practice, 18(1), 5–21. Kwon, S. W., & Arenius, P. (2010). Nations of entrepreneurs: A social capital perspective. Journal of Business Venturing, 25(3), 315-330. Langford, C.H, Josty, P., & Holbrook, J.A. (2013). Driving wealth creation & social development in Canada, 2013 GEM Canada National Report, The Centre for Innovation Studies (THECIS): Calgary, Alberta. LEAF (2005). The Equality Deficit – Chinese Immigrant Women in Canada. Women’s Legal Education and Action Fund (LEAF). LEAF’s Person’s Day Breakfast, Toronto, November 2. Light, I., & Rosenstein, C. (1998). Race, Ethnicity, and Entrepreneurship in Urban America, Aldine Transaction. Marger, M.N. (2001). The use of social and human capital among Canadian business immigrants, Journal of Ethnic and Migration Studies, 27(3), 439-453. Masurel, E., Nijkamp, P., Tastan, M., & Vindigni, G. (2012). Motivations and Performance Conditions for Ethnic Entrepreneurship. Tinbergen Discussion Paper No. 01-048/3. Nahapiet, J., &Ghoshal, S. (1998). Social capital, intellectual capital, and the organizational advantage. Academy of Management Review, 23(2), 242-266. Ndoen M. L., Gorter, C., Nijkamp, P., & Reitveld, P. (2000). Entrepreneurial Migration and Regional Opportunities in Developing Countries, Tinbergan Discussion Paper No. 00-086/3. Nicolaou, N., & Shane, S. (2009). Can genetic factors influence the likelihood of engaging in entrepreneurial activity?. Journal of Business Venturing, 24(1), 1-22. Portes, A., & Sensenbrenner, J. (1993). Embeddedness and immigration: Notes on the social determinants of economic action. American Journal of Sociology, 1320-1350. Razin, E., & Scheinberg, D. (2001). Immigrant entrepreneurs from the former USSR in Israel: Not the traditional enclave economy. Journal of Ethnic and Migration Studies, 27(2), 259-276. Riquelme, H.E. (2013). In Search of Entrepreneurial Opportunities - An Integrated Model. Journal of Enterprising Culture, 21 (3), 249-274. Sanders, J., Nee, V., & Sernau, S. (2002). Asian immigrants' reliance on social ties in a multiethnic labor market. Social Forces, 81(1), 281-314. Shepherd, D. A., & DeTienne, D. R. (2005). Prior knowledge, potential financial reward, and opportunity identification. Entrepreneurship Theory and Practice, 29(1), 91-112. Singh, R. P., Hills, G. E., Lumpkin, G. T., & Hybels, R. C. (1999, August). The entrepreneurial opportunity recognition process: Examining the role of self-perceived alertness and social networks. In Academy of Management Proceedings (Vol. 1999, No. 1, pp. G1-G6). Academy of Management. Swidler, A. (2001). Talk of Love. How Culture Matters. Chicago: University of Chicago Press. Vinogradov, E., & Kolvereid, L. (2007). Cultural background, home country national intelligence and self-employment rates among immigrants in Norway. Paper presented at the 8th ISIR Conference, Amsterdam, Sweden, 13-15 December, 2007.